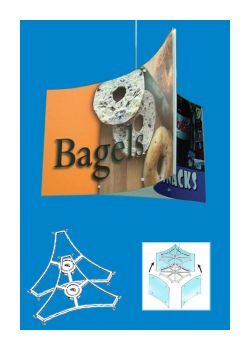 Our Mobile Ceiling Sign Hanging Kit Systems are a great way to advertise or market any information that you are looking to get NOTICED. By the nature of its construction, when suspended from the ceiling, any air movement will aide in slight movement, which helps to catch the target's eye. They come in either 3 sided (our Mobile Tri-Way unit in 2 sizes) or 4 sides with our Mobile Quattro version. Depending on the version you chose, the signage you install can range from 10" to 40" wide. Use board stock from 10 to 24 point. The mobile ceiling kits includes a complimentary Universal Plastic Ceiling Hook with 10/5 white cord up to 6 feet in length, barbed on one end. It attaches to ceiling grid "T's", pipes, cables, hooks, etc. Moreover, these ceiling display systems can also be used on the countertop or floor. Clip Strip Corp. manufacturers and distributes ceiling hanging display accessories to meet all your point of purchase store fixture needs. 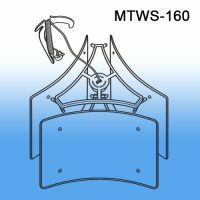 Minimum quantity for "Mobile Tri-Way Ceiling Sign Hanging Kit, MTWS-160" is 1. 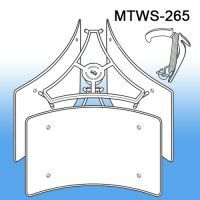 Minimum quantity for "Mobile Tri-Way Ceiling Sign Hanging Kit, MTWS-265" is 1. 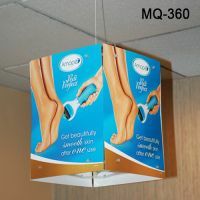 Minimum quantity for "Mobile Quattro Ceiling Sign Hanging Kit, MQ-360" is 1.